There are so many Halloween events throughout the state - let's focus on events that are doing things a little differently. Here are 7 awesome Kentucky events where families can enjoy friendly Halloween BOOs and SCARES. The World's Largest Halloween Party takes place at the Louisville Zoo. While I am sure that many have heard of the event there are bound to be some who weren't aware of the event! The zoo starts this event in early October and it runs through Halloween. You can find more information here. Just a tip it is pretty popular so going earlier in the season works out better in terms of crowds! Tickets are required but you can grab them here! Experience Halloween decorations and lights high in the treetops among 60 obstacles at the Treetop Adventure at Levi Jackson State Park. Hours are typically Friday-Sunday, with extended hours on Thursday, October 18th. Visit here for more information. Join in the fun in Winchester at the Halloween Festival, organized by Winchester-Clark County Parks and Recreation on October 19 or 20 from 6:30-10pm. There is something fun for everyone in your family, no matter their age and scare-tolerance. 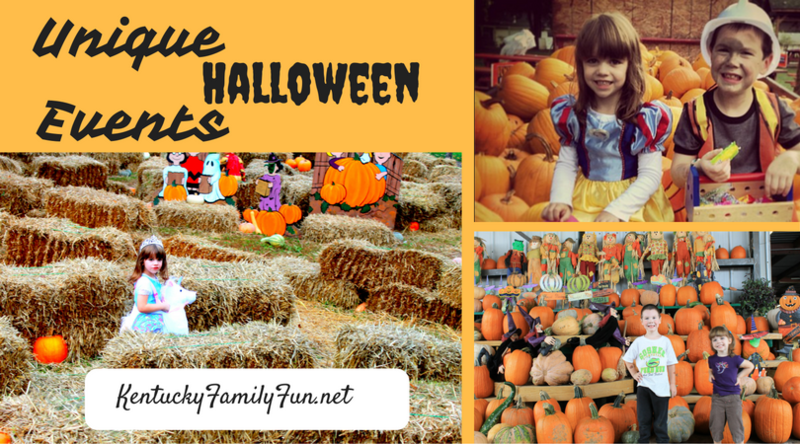 Activities include a haunted house, inflatables, pumpkin painting and face painting. Halloween Walk with the Animals at Salato Wildlife Center is October 27th from 12-4pm. It's a family-friendly Trick-or-Treat event so folks are encouraged to dress up and talk a walk on the wild side. The kids will receive a treat bag to collect candy and a passport which they will take to each of the indoor and outdoor animal booths to receive a treat (or trick!) - fun while learning about the animals. Hay maze, face painting, photo booth, and a fishing booth. Join the students, staff, and community of Transylvania University for Pumpkin Mania, which will include at least 5,000 uniquely carved pumpkins. On October 30 at 7pm families can walk among the jack-o-lanturns to trick-or-treat, listen to music and take part other children's activities. Main Street Wilmore, described as a little Kentucky Mayberry, will be blocked off and businesses and individuals will be handing out treats for Treats on Main on October 31st. There is a costume contest at 7:30pm in the Pavilion - bring your best because the people of Wilmore bring their best creative ideas. This is a safe and welcoming experience that despite any cold weather, will warm you. Check out our Pumpkin Patch list!